Wow! It's hard to believe a whole year has passed since the very first Wacky Watercooler Blog Hop. I'm thrilled to be a part of the celebration. You've arrived here from Deborah Smart's blog and her great projects. Our focus for this hop was the new 2014-2016 In Colors and the new Designer Series Papers. You do know there is a special on this month, right? It's a Buy 3, Get 1 Free. You'll definitely want to check that out! My order didn't get here in time for me to use the new Designer Series Papers I ordered, so I used papers from the new Moonlight Designer Series Paper Stack, which is not part of the above mentioned special. Each card I made does show off the new 2014-2016 In Colors, which are totally fabulous. I can't get enough of them! For the first time that I can remember, I can say I actually like the color orange. Tangelo Twist just seems to jump out at me and force me to like it. I saw a similar card in my browsing but the person didn't have a watermark so I don't who to give credit to but I do thank them for sharing it. If you know who it is, please let me know so I can give proper credit. The only differences in my card from the original is the orientation and the sentiment. My third card is an anniversary one to celebrate our year of Wacky Watercooler blog hops. I am loving the richness of those new In Colors! Blackberry Bliss and Hello Honey look so well together. Don't you think so? Now it's time to travel over to see what fantastic projects Priscilla Ivler has in store for you. To visit Deborah Smart's blog again and see her wonderful projects, click the image below. Let's start at the very beginning, a very good place to start, just click the image below to head home to Wacky Watercooler Stamping. I love your creations, Marsha! thank you so much for sharing and being a part of this blog hop!!! Happy blog hop anniversary to you!!! Thanks, Terri. I have so enjoyed the Watercooler Blog Hops. 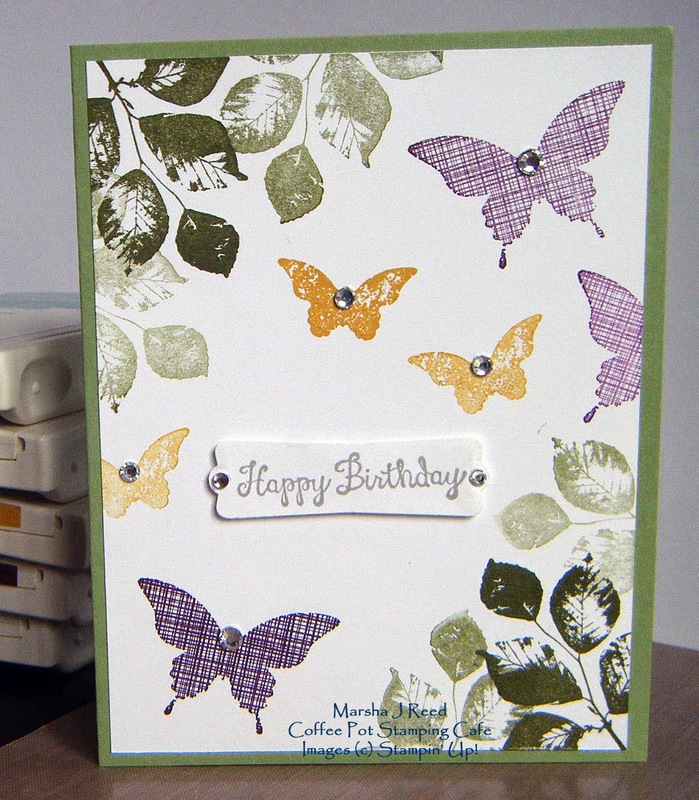 Fabulous cards, Marsha! I love your Kinda Eclectic card - can't wait to get my set, now. Happy blog-a-versary to you! Thanks, Deborah. I love that Kinda Eclectic set. What beautifully arranged cards. Kinda Eclectic is a favourite of mine as well. I, too, love all the new In-Colours - although I have yet to use the Tangelo Twist. It looks great with the Blackberry Bliss and Lost Lagoon flowers. Thanks, Gail, for leaving a comment. I am loving all the new In Colors. They are so rich. I have several Autumn ideas floating around in my head, too. Hi Marsha, thank you so much for being part of the Wacky Watercooler "gang" and also part of this 1st Anniversary Blog Hop. I, too, love the new In-Colors and that Kinda Eclectic stamp set. Your cards really show of the new colours and Designer Series Paper beautifully. Thank you for sharing. Thanks, Heidi. I have enjoyed the Watercooler blog hops. Marsha, these cards are so lovely. Beautiful job. No favorites here, I love them all. Thanks, Christine. I appreciate your kind comment. Kinda Eclectic is going on my list of stamps to buy, fun to see your work. Thanks, Kath. I love your work and really appreciate your comment. 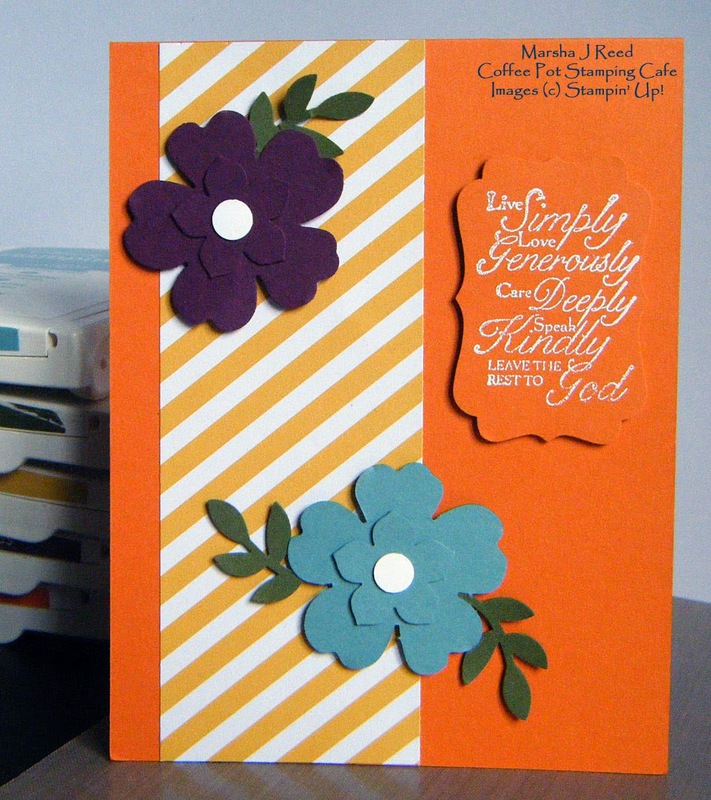 Beautiful cards, Marsha, fabulous color combinations! Thanks, Kathe. Stampin' Up! makes it easy when they come out with colors like these new In Colors.